I don’t think I’ve done any garden posts since the spring planning post, but I know I’ll regret it if I don’t do at least one (for my own purposes later!) so here it finally is. 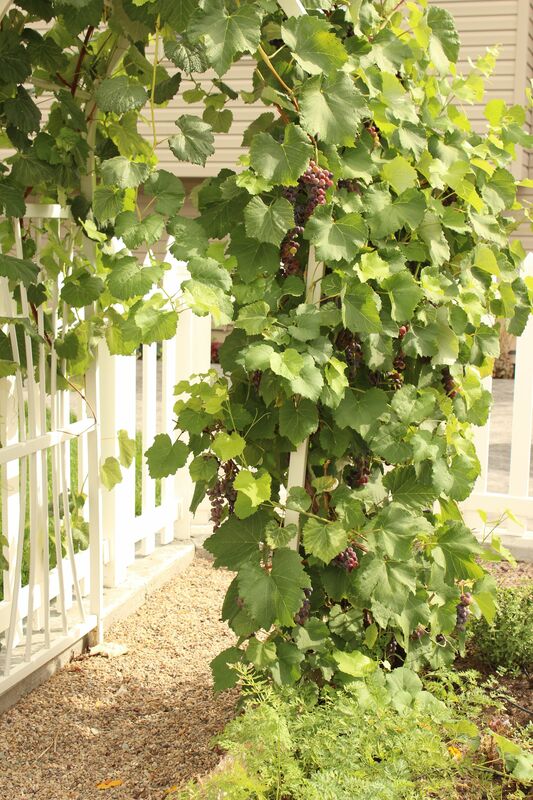 This is our first year the grapevine has produced grapes! They are delicious (and tiny), and tart. I need to figure out a way to use them up before the birds get to them all. Hannah loves them and will eat them (halved) pretty much as long as I’ll let her. They are taking over the arbor I put them on and finally beginning to stretch and wind along the garden fence. I think they make the garden look so beautiful! 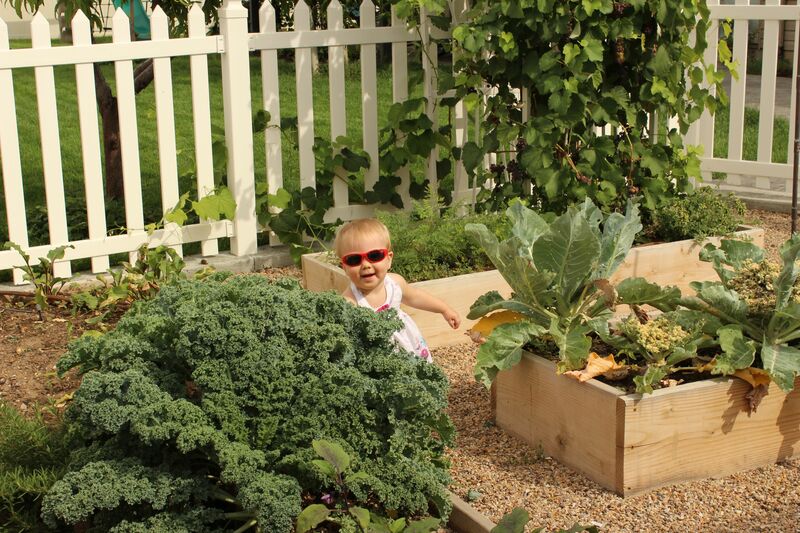 Hannah is such a helper in the garden. 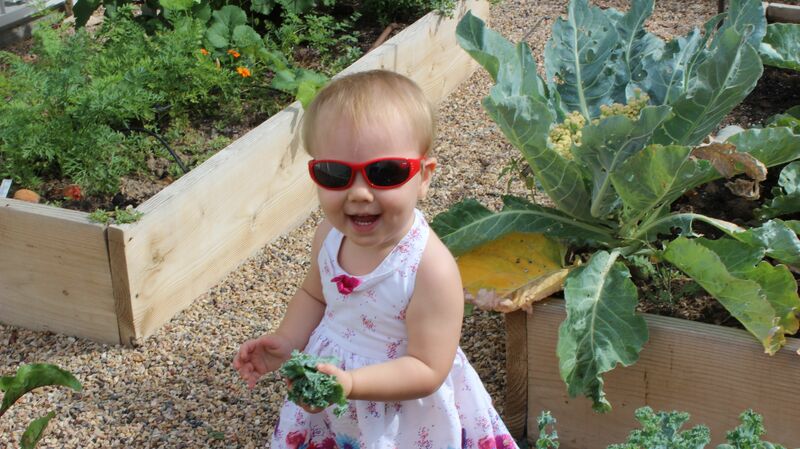 She’s “helping” me pick kale here. 🙂 The kale is out of control. I’ve made a few batches of kale chips in the dehydrator and snuck a bit into sauces here and there, but haven’t used it like I should. It is prolific and I think it came back from last year (I can’t be sure). In the same bed beyond the kale are a couple beets – I harvested the majority and canned pickled beets. My fave! I can’t wait to dig in this winter. I left a few for juicing the rest of the summer. Mmmm. The small bed behind Hannah is the grape, and some carrots. The one in front of that is ginormous and completely wasted cauliflower I need to dig up. It just got too hot. 😦 I’d never attempted cauliflower before and grabbed the plants on clearance close to the end of planting season just to try it out. Better luck next time. What you can’t see is my mint, rosemary, oregano, eggplant, comfrey, and onions. You’ll just have to take my word for it that it’s all there. 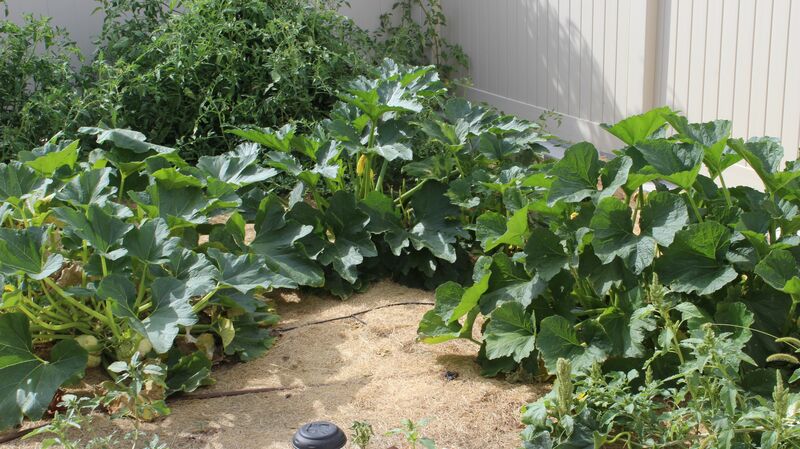 I have a second garden space in the RV pad, and I planted all the sprawling plants like zucchini, pumpkins, cucumbers, and tomatoes, rhubarb, plus a few pepper plants. The pumpkins are super cute. I’m getting lots of zucchini and cucumbers (I’ve canned pickled versions of both). The peppers have done only ok, and the tomatoes are getting a late start, but there are plenty of green ones out there. I need to prune them all back so badly. I should have done so before taking pictures but if I waited for garden perfection I’d never get to post! More of the RV pad garden. This is all obscured from view by our camping trailer (unless we take it somewhere of course). You can see the drip system in this photo. It’s not fancy but it does the job without having to hand water or use more water than needed. Mulching the entire bed with grass clippings helps keep the water use down and weeds down. These killer tomato plants were sent to me as babies from Seed Savers Exchange. 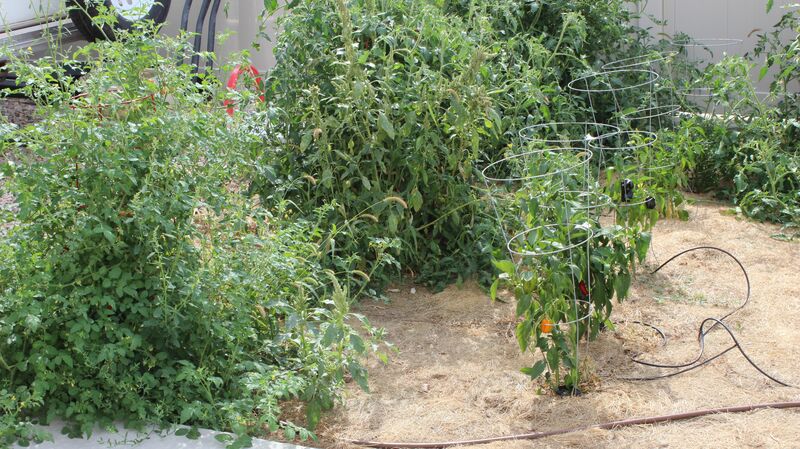 I had really high hopes for a big harvest, but it’s been a weird year for Northern Utah gardens. Warm/dry winter, rainy summer. It’s kind of perfect for my own personal comfort, but apparently it’s not great for growing. Bummer! Still time for a bumper crop I suppose. This is the back of the house garden – and all of this was just planted in the Spring! It’s filling in so well. I have hostas, coral bells, ferns, violas, thyme, columbine, and coleus (the coleus is the only one that won’t come back next year). All are shade loving and drought resistant. The blue pot is now empty but not long ago was home to a beautiful blue hydrangea. I’m a hydrangea-killer! 😦 The geranium in the black pot isn’t doing so well, either. Perhaps it needs more sun. In a year or two, this space will be crazy-pretty. I love gardens along a patio. Here’s a view of our huge expanse of lawn from the vegetable garden. My brother-in-law’s family brought in the giant swing-set. 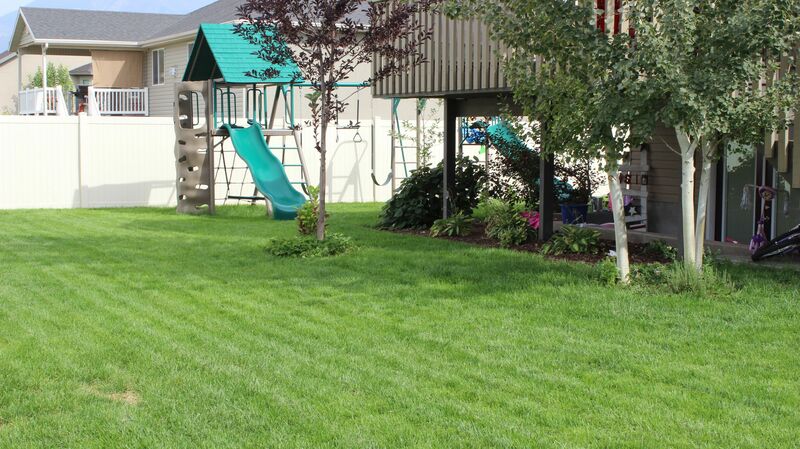 Mowing around it is the bane of my existence, but I like the idea of taking up some lawn so if/when we get one, I’ll absolutely be putting a large rectangle of bark around it. The plants under the deck are filling in the space nicely, too. The shady areas were the hardest for me to plan initially, but they’ve become the prettiest and lowest maintenance areas of the yard! Around the Aspen trees is my herb garden. We planted four trees this Spring – two apple trees and two flowering pears. The pears for (eventual) privacy along the back fence, and the apple trees in the side yard near the swing-set. You can see one of the pears in this picture. They are still tiny, but in a few years it will really help obscure some view from the back neighbors (gotta love the ‘burbs). It’s been a great August, with few days in the triple digits. I love spending time with my girl and my plants. 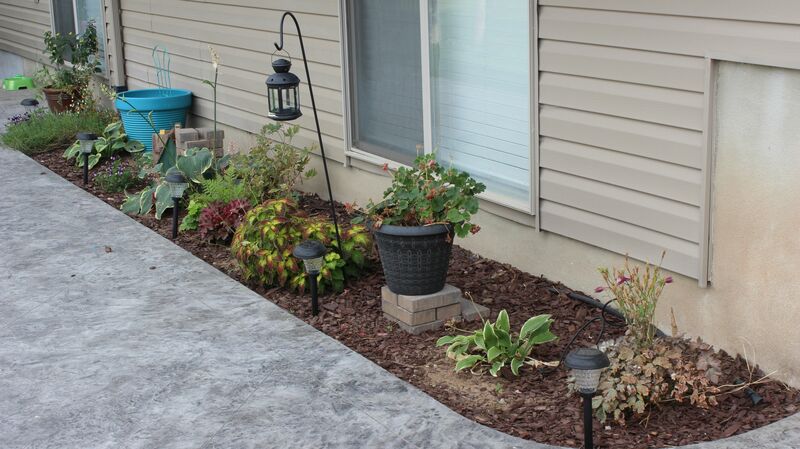 The front yard needs a lot of work this fall – mostly it’s an overgrowth/neglect problem. I’ll give it some proper attention in the coming weeks and try to post on it. A before and after would probably be in order. Hope you enjoyed my little garden tour!